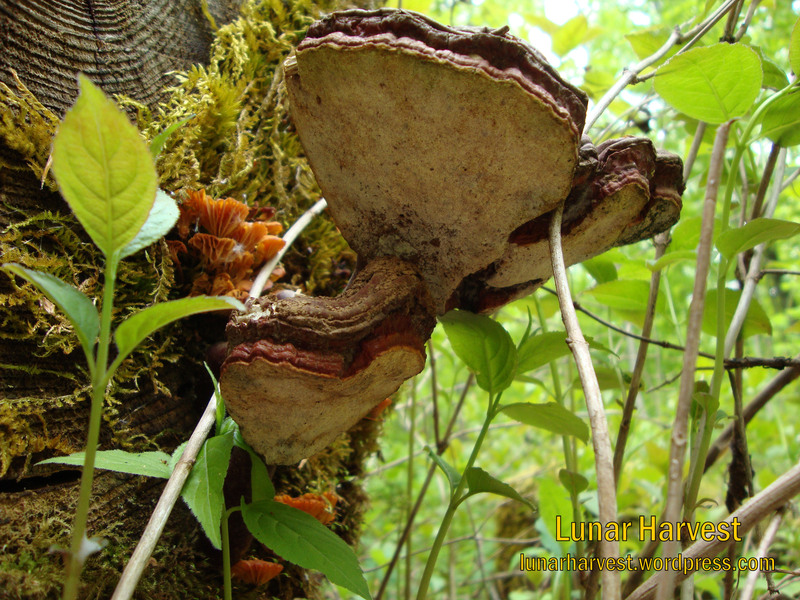 A May Wildcraft – Reishi and Lady’s Slipper! (Lonicera sempervirens) – I love honeysuckles and this is one that I found growing in the forest’s edge in a small cluster. I am hoping to find another one in a few weeks when in full bloom and add its picture to this entry. The way the opposite leaves almost make a cup around the flower cluster always catches my attention. These flowers are very pretty and have a wonderful, sweet scent, hence the name ‘honeysuckle’, a hummingbird favorite. (Mitella dphylla) – This little delicate flower was growing in the deep woodlands alongside Toothwort, White Trilliums, birch trees, and hemlocks. It can grow almost anywhere in our area but prefers moist soils. I like this plant because the leaves are mirrored symmetrically at the stem and also the way the waxy little flowers remind me of snowflakes. Medicinal uses: You can make an infusion from the leaves to treat fevers and as eye drops for sore, red eyes. (Cypripedium calceolus) – Lady’s Slipper is also known as ‘Nerve Root’, among others. What a find this was! I knew they grew in our area and are common in Europe, but this is something I have not found or seen outside plant books. The basal leaves were very camouflaged and as we were walking home through the forest trail, my sister’s partner, Kevin, told us he had found something. Katie and I immediately saw the ‘slipper’ and were so happy he found it. It does really have the shape of a shoe; I guess the name was a ‘good fit’….. 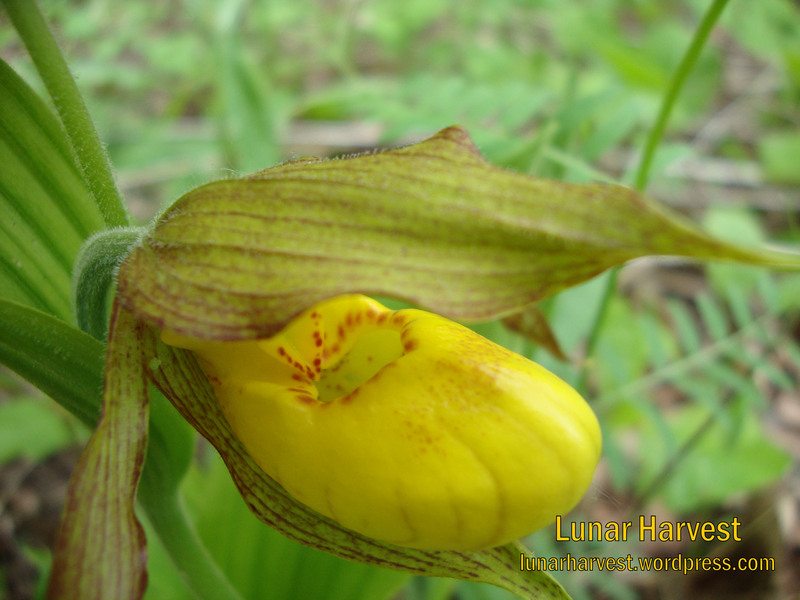 Medicinal uses: Lady’s slipper is most known for its sedative and relaxing effect on the nervous system. It is characteristic of this orchid to have a strong, bitter, pungent smell. 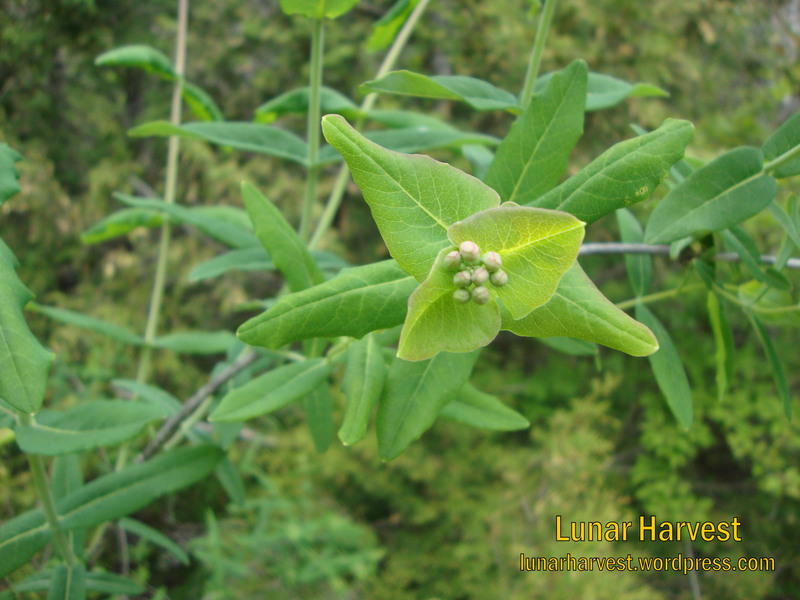 North American Indians used it as a sedative and antispasmodic to ease menstrual and labor pains and to counter insomnia and nervous tension. Nerve root might act as a drying agent to help shrink blood vessels. 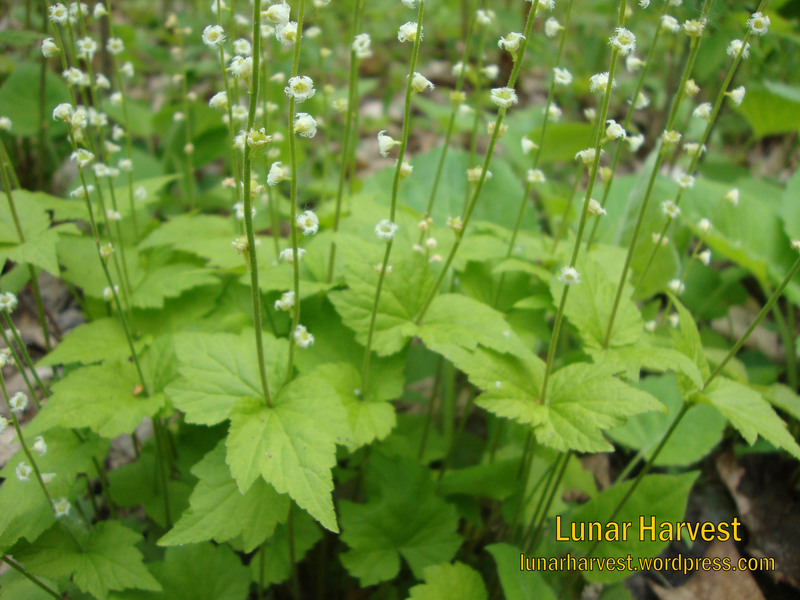 (Dentaria maxima) – I found this plant growing in many areas of our forest walk, noting its similar posture to the Miterwort. A very nice show of white flowers carpeting the forest floor in small patches. 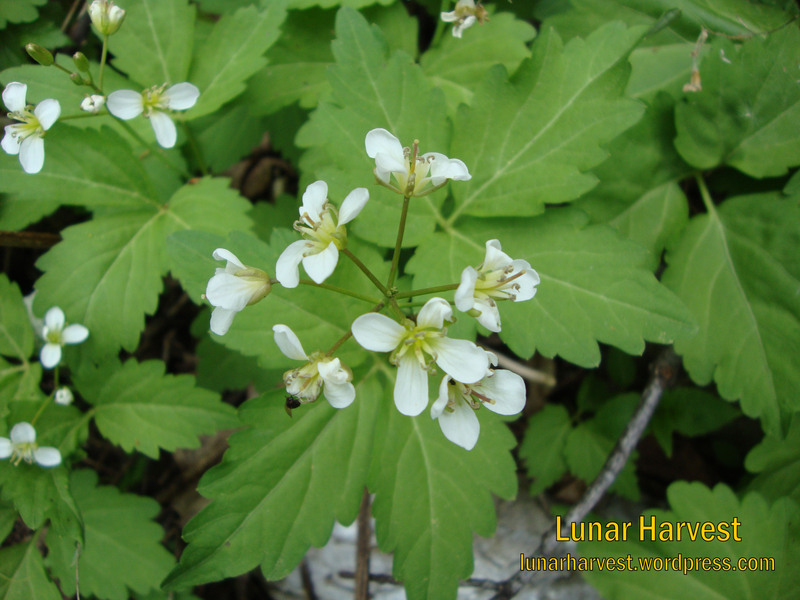 This plant is very frost hardy (down to -20 degrees C.) and can be found near rivers and creeks, or in shady forests. Edibility: Root – You can eat the root raw or cooked. Traditionally prepared by harvesting the pungent root and piled into a heap, fermenting for several days. This allows the root to sweeten where it is then boiled. Medicinal uses: Again, the root is used as a ‘stomachic’ that helps tone the stomach, improving overall function and increases appetite. 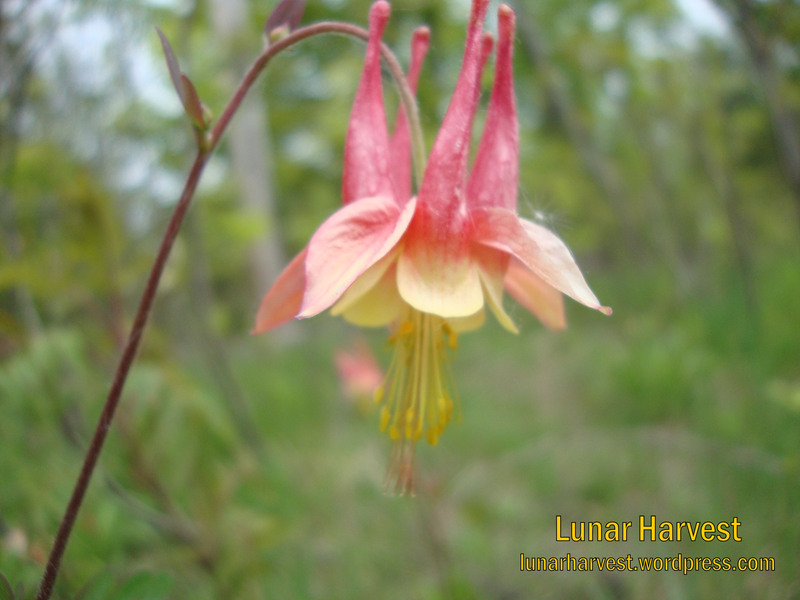 (Aquilegia canadensis -L.) – I first noticed Wild/Canadian Columbine when I was living in B.C. and first started to have an interest in wild flowers and identifying them. They really remind me of a nodding onion with the way they are so delicate, bowing down towards the ground. You can find these rosy plants in open or shaded forests and in rocky areas. 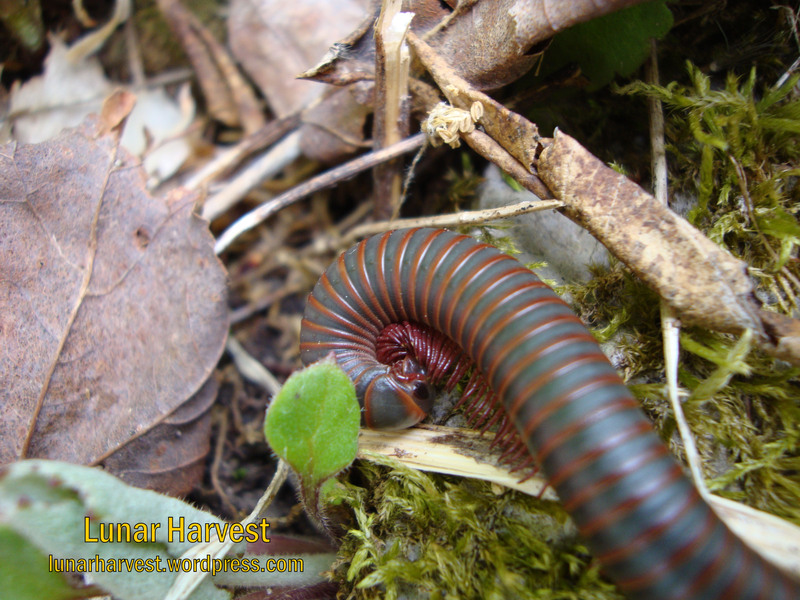 I found this one in the picture above near a gravely road in the open sun, next to a coniferous forest. Their range covers most of North America. They can grow in acidic and alkaline soils, flower May to June, and grow about 2′ tall. Wild Columbine are perennials. Note: Not known as toxic but other members in the Ranunculaceae family are known to be slightly toxic so caution is advised. Medicinal uses: The root is astringent and diuretic. It is chewed or made into a weak tea for the treatment of diarrhoea and stomach aches. The tea is used in the treatment of uterine bleeding. The boiled plant was used as a hair wash. The seed is anodyne and febrifuge. An infusion is used in the treatment of headaches and fevers (PFAF, 2012). (Aralia nudicaulis) This was an interesting find! At first glance I thought we had found ‘Dwarf Ginseng’, but after a closer look, we saw we had found another usable root, Wild Sarsaparilla. They like to be in dark, rocky, forested areas, found on the eastern half of North America. A perennial that grows just over a foot tall. You can notice the white cluster of flowers and the draping leaves that are taller than the flowers (unlike my mistake with Dwarf Ginseng). 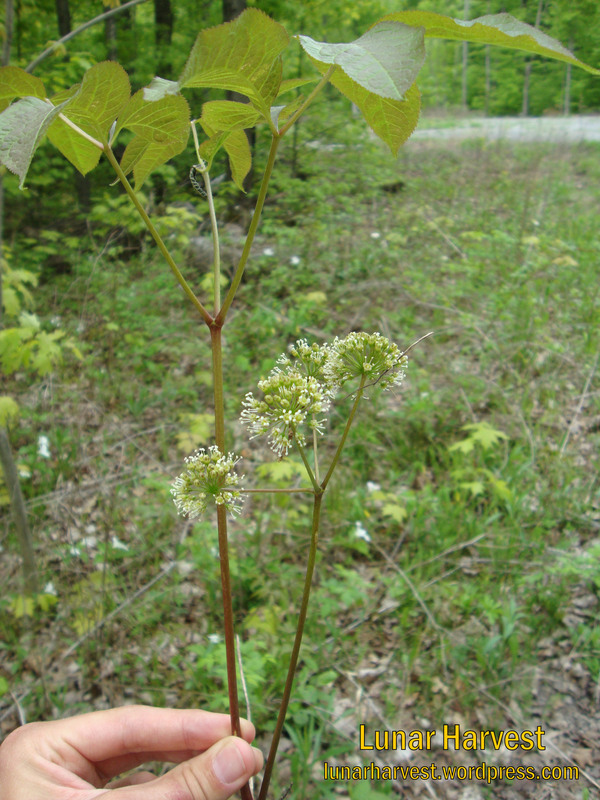 Medicinal uses: Wild sarsaparilla is a sweet pungent tonic herb that acts as an alterative. It had a wide range of traditional uses amongst the North American Indians and was at one time widely used as a substitute for the tropical medicinal herb sarsaparilla. The root is an alterative, diaphoretic, diuretic, pectoral and stimulant. The herb encourages sweating, is stimulating and detoxifying and so is used internally in the treatment of pulmonary diseases, asthma, rheumatism, stomach aches etc (PFAF, 2012). 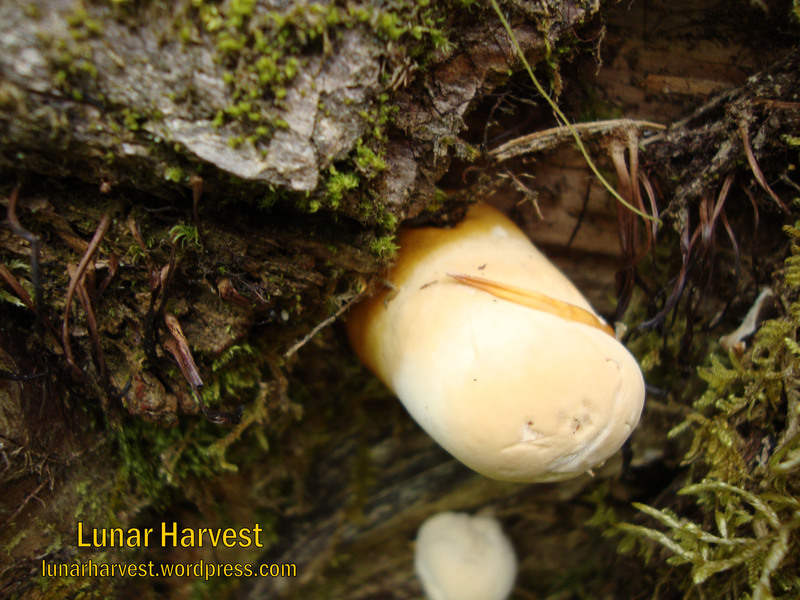 We found these baby fruiting Hemlock Reishi mushrooms on the same Hemlock stump as we found the mushrooms last year. There were about 8-10 new blooms this year which is good to see that we did not over harvest the mushrooms last year! We will be going back to harvest one or two this summer (with photos to come). Newcomb, L. 1977, Newcomb’s Wildflower Guide. Knopf, A. 2001, The National Audubon Wildflowers; Eastern Region, Revised Edition.